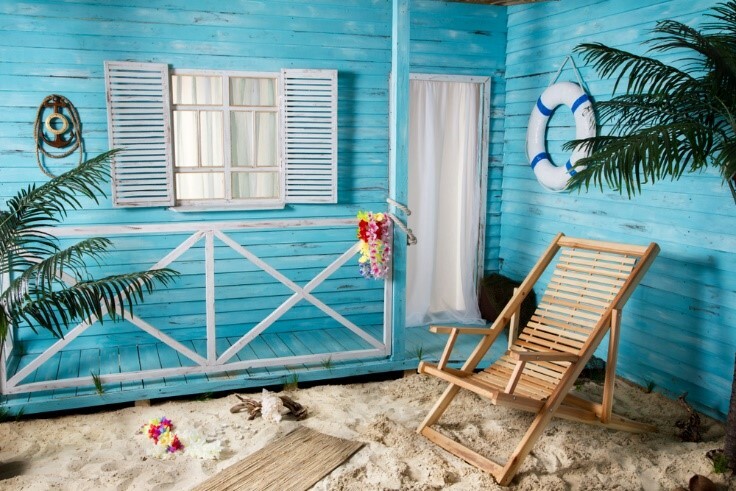 You don’t need to own beachfront property to have a house with beachy vibes. Homes near the coast often have a beach-centric decorating scheme — but this aesthetic can quickly turn stale, so it is important that you pay attention to beach décor trends to keep your styling fresh and attractive. Here are a few of the latest and greatest looks in beachy and breezy outdoor design, so your bungalow will look chic in the New Year. For a long time, a monochromatic neutral palette was smart and stylish — not just in beachy properties but across the wide decorating scheme spectrum. However, color is finally seeping back into design, and if you have a beachy space, you shouldn’t be afraid of adding vibrant pops to your outdoor space. You should try to focus on tropical hues, like bright aqua, fuchsia, coral orange, chartreuse or forest green, golden yellow and the like. You can incorporate your chosen color(s) in throw pillows, art and even the flora you plant in your yard. Ideally, your coastal hideaway is in some warm-weather locale, where the tropical climate can sustain tropical plants. Landscaping a beachy atmosphere in a city like Miami is easy because plants like palms and philodendrons grow easily. It’s wise to create layers with the greenery, so you can have lush ground cover, midsize shrubs and large, shady trees. It’s okay to go almost overboard with the flora in your yard to produce an oasis-like effect — but you will also want to hire a MIA lawn mowing and yard care service to maintain it for you. The beauty of the beach is its near-immediate calming effect, which you should try to introduce into your backyard design through Zen elements. To hit the nail on the head, you can include a stone garden surrounded by sand or gravel, which you can comb meditatively when you need a mental break. For a less overt Zen touch, you might add a water feature, which will add a pleasant bubbling that drowns city noise. At the very least, use natural stone for pathways or mulch and include a few Buddha statues in your décor. If you aren’t lucky to have your beach bungalow in a tropical region, you can artificially raise the temperature and increase the light with an outdoor wood-burning fire. You might build a fireplace replete with chimney into your entertaining space, or you might construct a rough fire pit somewhere in your yard. The fire is an attractive and peaceful feature that keeps your yard functional even when it isn’t beach season. Shabby-chic has been en-vogue for some time, but the style of lived-in or roughed-up furniture and décor is passing by the wayside. Today, you should focus only on acquiring chic pieces for your outdoor design. That means clean, matching furniture sets made of modern materials like stainless steel or glass. You should also try to find elements with strong angles; geometric designs are more trendy than rounded shapes and curves. When the beach weather is nice enough, you should strive to spend every moment of your day outside. That means building living spaces in your backyard where you can cook, lounge and entertain. 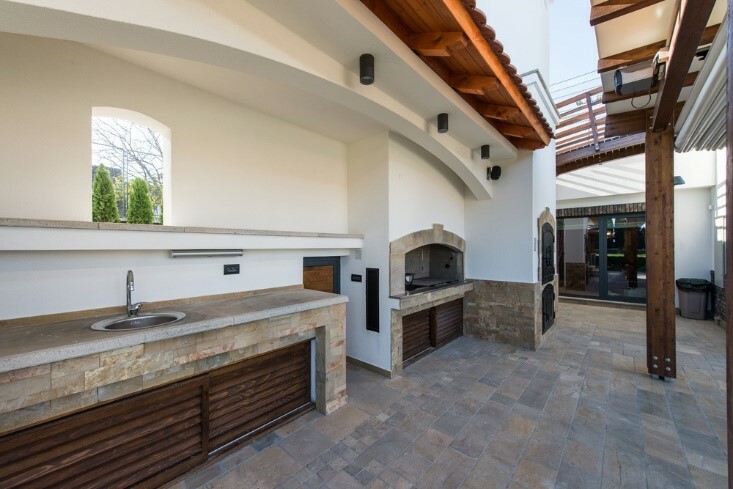 Outdoor kitchens are perhaps one of the newest and most popular additions to beachy backyards; to construct this space, you will need a small refrigerator and a grill, but you might also incorporate an oven. Then, you should have a dining space, which might also function as a place to lounge or entertain. It is important to keep at least some of your outdoor living spaces under cover, so when the rainy season comes, you can still enjoy your backyard. A practical design precaution rather than an aesthetic one, you should ensure that all the elements of your beachy backyard will survive whatever weather the coast throws at it. At the very least, your seating and décor should be waterproof, but you might also consider bolting everything down if your region is sometimes subject to high winds or hurricanes. The trends listed above are likely to keep your coastal home looking chic for years to come, as long as you invest in high-quality materials and pay attention to upkeep. You don’t need the beach in your backyard to ensure tranquil, fun beachy vibes.